Hali Bernstein Saylor/Boulder City Review Sen. Dean Heller reads a certificate congratulating the Nevada State Veterans Home in Boulder City on its 16th anniversary and accomplishments of the past year during a celebration Aug. 8. Linda Gelinger, administrator of the home, accepted on behalf of the home and staff members. It was one of the many certificates presented to the home. 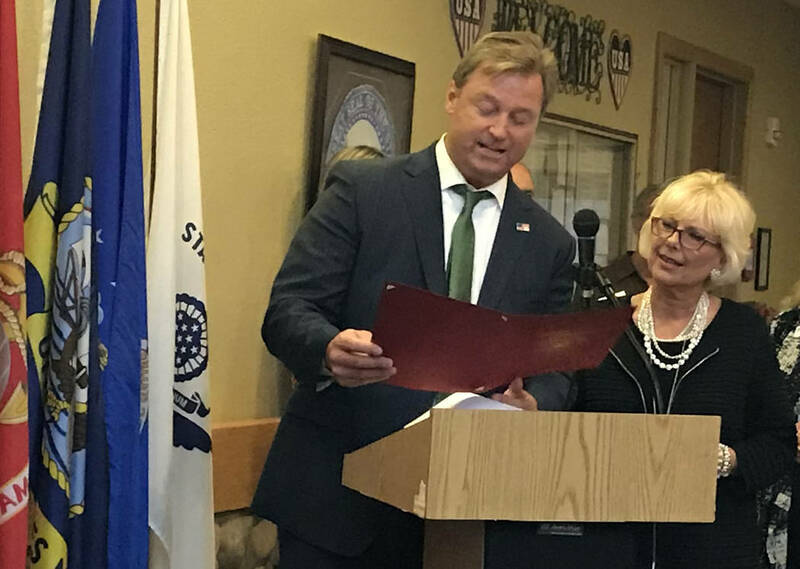 Sen. Dean Heller reads a certificate congratulating the Nevada State Veterans Home in Boulder City on its 16th anniversary and accomplishments of the past year during a celebration Aug. 8. Linda Gelinger, administrator of the home, accepted on behalf of the home and staff members. It was one of many certificates presented to the home.